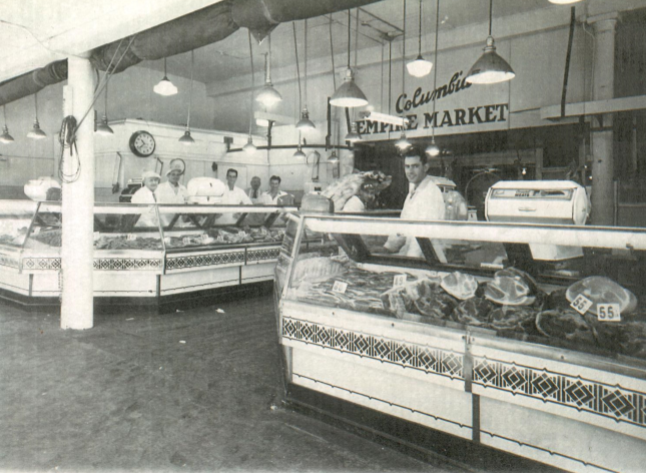 Columbia Empire Meat Market began in the early 1920’s in Downtown Portland operating in the Yamhill Street Market. This open air market was located on SW 4th Avenue and Yamhill. It operated Monday-Saturday with a 70% retail customer base and was limited to only 30% wholesale business. To envision the store front, there was chicken coop wire for security and a roll down canvas curtain with sawdust floors. The sawdust floors were maintained and raked out with clean sawdust every evening. The original owner was Michael Lux, father of Edwin and Jerry, who died early in his life from pneumonia in his mid-30’s. Both sons worked there for a long period of time. Ed bought Jerry out of the business and worked ongoing as his family was growing. Jerry left and then came back and worked for Ed at a later date. As time passed and we entered the 1960’s the marketplace was changing and there was no longer a place to park delivery vehicles for the wholesale business. The wholesale business had great potential and business was limited downtown. It was time to relocate and Ed Lux purchased the building that we currently reside in and Columbia Empire Meat Co. moved to the Brooklyn neighborhood. Our buildings were originally occupied by Canteen vending who relocated and we started the wholesale distribution business that we maintain today. In the beginning, there was 3 delivery trucks and 2 salesmen. The patty machine moved with the operation and a freezer was installed as well as a meat chopper. At this point in time, Portland had multiple slaughter houses operating in the Columbia River slough. Portland was actually quite a slaughter house town. Columbia Empire would purchase 3 truckloads of beef carcasses a week and 4 butchers worked overnight and 8 full time butchers worked during the day breaking down the carcasses in order to make ground beef and whatever other beef items that were requested. Bulk ground beef was packaged in 10# chubs and distributed. Beef bones were backhauled to the slaughter houses and we produced massive amounts of bulk ground beef that was sold to the various school districts, local restaurants and ship suppliers. Our current location also had sawdust floors over concrete in the beginning because it soaked up fluids and is a natural antibacterial. There was not any vacuum-packing capabilities at that point in time so products were produced to order. A weekly load of pork came from the Pierce Packing plant in Billings, MT. Henry Thiele’s Restaurant in Lincoln City, Whiz Burger in SE Portland, and Frosty’s in Rufus, OR were part of the original customer base. Frosty’s remains in business and we make weekly deliveries to them currently. It was the norm for most kitchen staff to cut their own steaks at that point in time. Columbia Empire had more business than they could accommodate and additional delivery trucks were purchased in 1967 and then again in 1971. 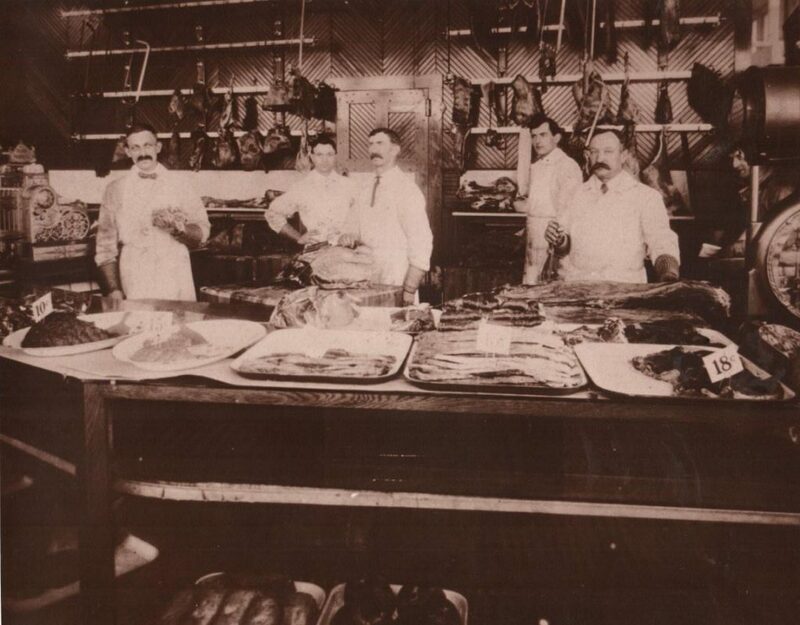 Fabricated items were not available, so butchers were a large part of the workforce for the first couple of decades in our current location. The marketplace took on more changes when meat inspection went from being a state governed agency to what we know today as the USDA. It wasn’t until the late 1980’s that beef trim came into the market and fabricated products began to become available. As this transpired, slaughter houses closed, and we began to use suppliers, such as IBP and Washington Beef. The marketplace has been ever changing continually as portion control and prefabricated items became more and more available. There was a fire at Columbia Empire in July 1987, but we are very resourceful and it did not cease business or deliveries. Over the next month, we used our friendly competitors’ cutting floors and our butchers had to complete the job offsite. We rewired and relocated necessary equipment and made it operational once again. We do what our customers request and our product lines are dictated by the customer’s needs. The original bookkeeper that moved from downtown retired, and our accounting system became computerized in 1996 which made invoicing, tracking, and reporting much easier in all areas of the operation. In 2005, HACCP requirements were initiated which reinforced quality control and safety at the forefront of our core values. The plant, production equipment, and the delivery fleet are constantly upgrading and expanding as time goes by. Over the last century, Columbia Empire Meat Co. has continually succeeded in providing the best customer service in the industry. The finest products and our unmatched customer service have always been our top priorities. Ed Lux worked his entire life at Columbia Empire Meat Co. and passed away in 1994. 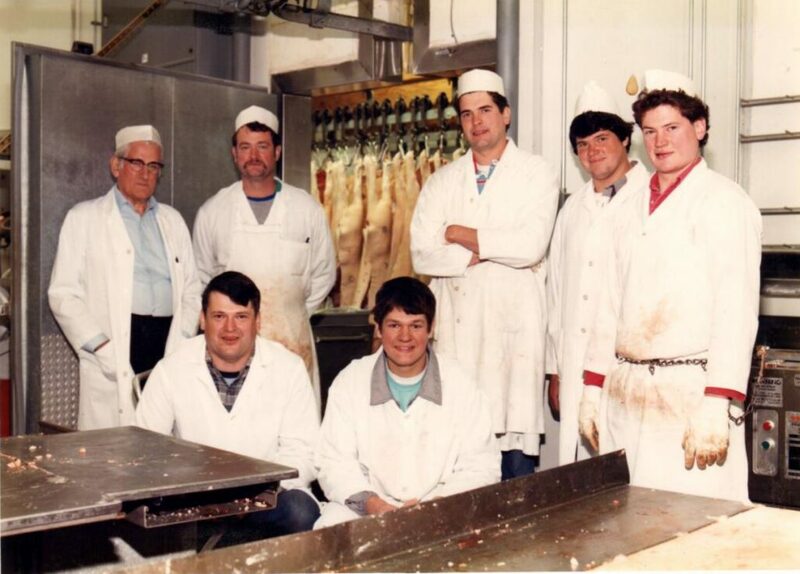 Ed made sure to teach his 6 sons all of the different meat plant positions and they have all worked here at various times and of different capacities. Mike, Jerry, and Bob Lux took over the reins and are the current owners of the company. Mike retired at the end of 2016. Jerry is our current warehouse manager. Frank is our maintenance engineer. Bob is onsite on a daily basis as our operations director. Dave retired in 2003. Greg passed away in 2012.